So, I totally spaced on taking a good picture of my WIP and reading today. 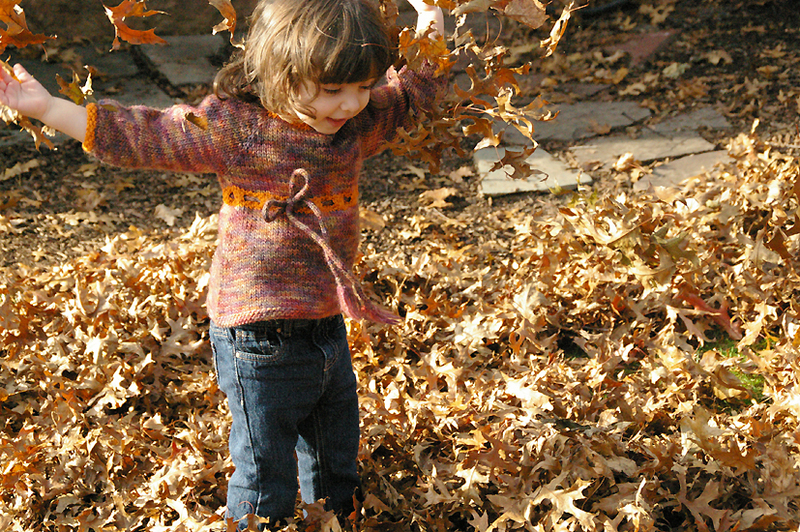 I figured I’d use a little “fall fun in knit wear” in lieu of knitting photo this week. 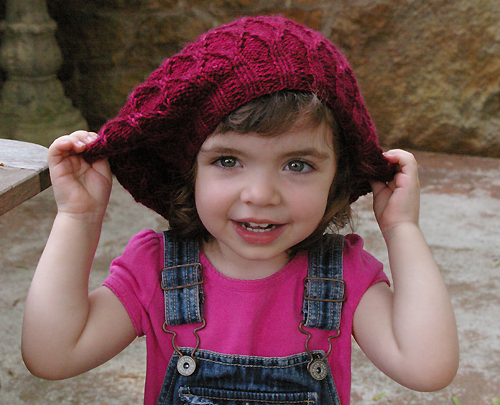 As I was hopping around the internet while looking for the Cat Bordhi you-tube video demonstrating the Moebius Cast On for knitting my Wombat Tunic (aka Harmonia’s Rings Tunic), I decided to stop in Cat’s own website to see what goodies might be there. Well, I stumbled upon a little treasure in the reading department quite unexpectedly. She has in her pattern pages a “Knitting in Schools” Cirriculum that summarizes her experience teaching knitting and textile arts in her humanities classes, and how that became a formal curriculum teaching a wide variety of subjects through the discovery and practice of making yarn (spinning) and knitting! It was so nice to see someone really fully explain how the study of making string and making things with string, can become a study of anthropology, history, group dynamics, invention, physics, chemistry, biology, geometry and even more. 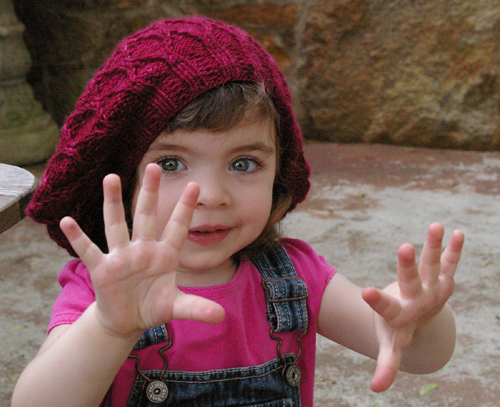 As I have been teaching the crochet and knitting classes over the past weeks, these topics have come up as related to knitting and I think it’s really fascinating to see how Cat Bordhi synthesizes what many of us hybrid math-history-art thinkers know in our hearts – knitting can be so much more than just a hobby. I’m definitely going to be exploring the reading lists and recommended projects for myself and Lil One. I recommend giving it a read if you have kids or work with them – it could be a fun new way to “teach” all kinds of things! Of course, I’m also enjoying knitting my Wombat Tunic using my Sundara Yarn in Arabian Nights which I have been waiting to use for a couple of months now. 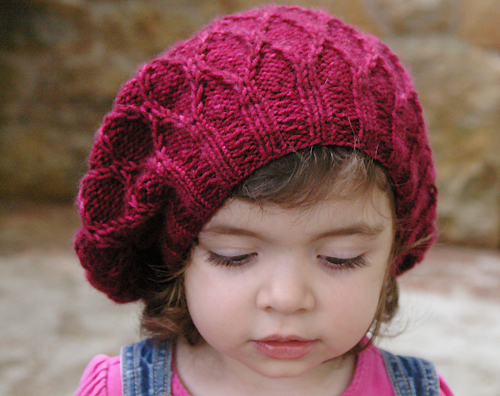 So soft, and the purple-brown palette is just so mysterious and cozy all at once. I can’t wait to see how the geometry unfolds on the pattern! Happy knitting and reading out there! 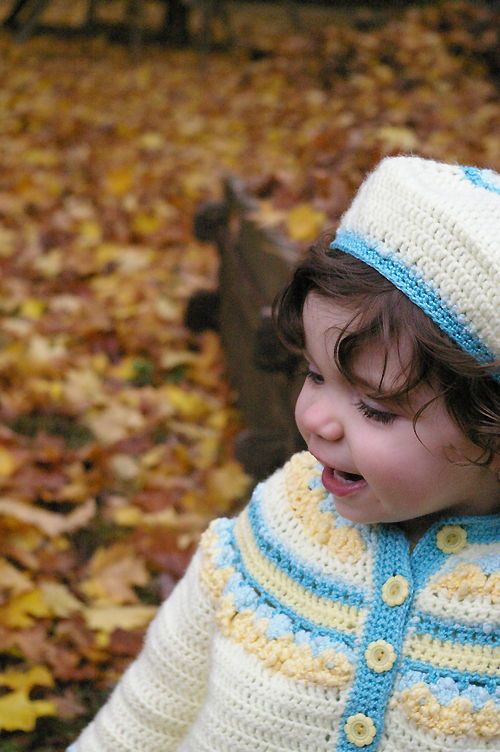 Enjoy the fall weather – I know we will! My sock knitting adventure has only begun – but what a great start! I wanted to share my progress, and a little “Mommy & Me” photo shoot Hubby did for me the other day. I hardly ever get pictures of me and my daughter together, so when our matching socks were done, I decided it was time to change that trend. 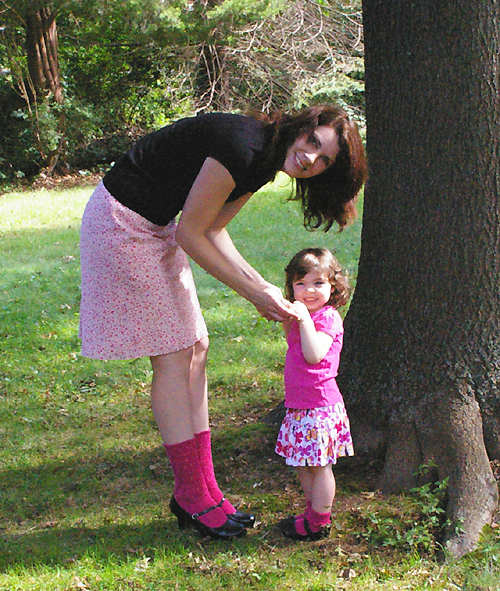 Here we are showing off our hot pink socks before the weather cooled down this week. 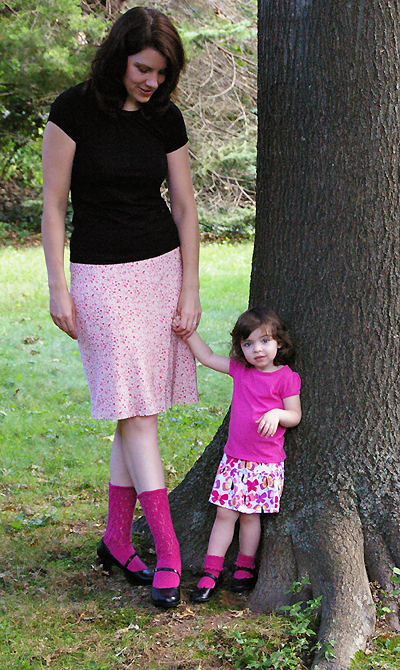 Her Pink Princess Socks are the pattern “Emma” by Jackie Lauseng, knit in the “toddler” size with Cascade Heritage Sock Yarn, in Candy Pink. The only modification I made was to kitchener the toes about 2 rows early because she has a baby shaped foot – wide toes, but not long. They are snug, but she has a 7-8 toddler shoe size which I think is a bit big for her age. If I made them again, I’d just go up to a U.S. 1 needle and follow the same numbers to make it slightly larger. I think overall it is a great little pattern, and was a good choice for a first sock for me because I didn’t get bogged down by a fancy lace or anything while learning the basic heel-flap top-down sock. For Mommy’s Pink Socks, I used the same yarn, and I made the lace patterned “Veil of Leaves” from the Cat Bordhi Book I was primarily learning sock knitting from. My first full-sized sock knit, and a short row heel, and my first time wearing a hand knit sock. Oh my gosh! I will never be happy with commercially made socks again. 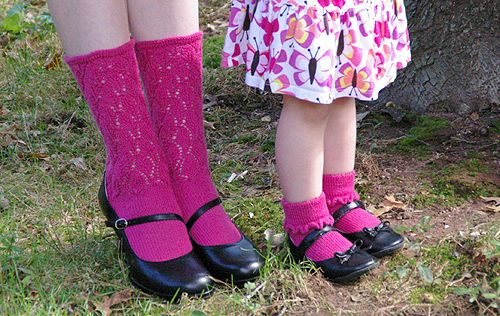 I totally understand why people love to make socks – it’s fun and you get to have luxuriously wrapped cozy feet! I made no modifications what so ever, and they fit fine. My only issue is that they don’t stay up very well, so I may insert a little elastic in the cuff next time. So, that’s how the new adventure is going. Now I just need make a whole lot more because I can tell I’ll have these worn out by Christmas if I wear them as much as I want to! 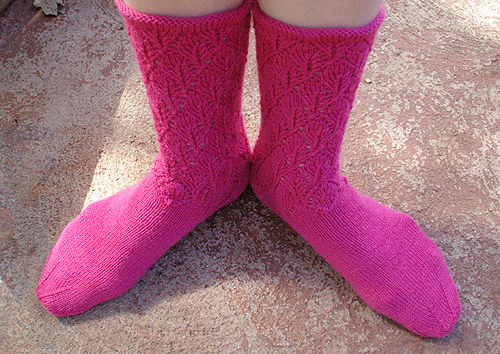 Next up – toe-up socks, perhaps the “Milkmaid’s Stockings” from Cat Bordhi. 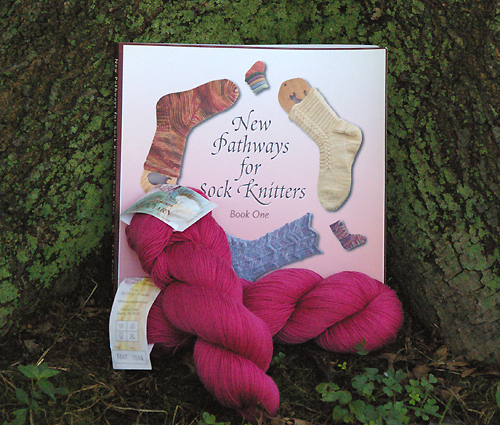 I know many knitters feel the same way, and I just have to join the chorus – I Love Sock Knitting!! I also think it was great to share with my Lil One, and so nice to be in the picture with her for a change. Just look at our goofy, happy faces!